and wallcovering manufacturers at Heimtextil 2014. HP Expands Suite of Custom Wall Décor Solutions The first major international trade show of the year saw HP participate at Heimtextil 2014, in Frankfurt, Germany, 8 – 11 January, billed as the biggest international trade fair for home and contract textiles. The company showcased an expanded digital printing solution for wall decorations designed to help print service providers (PSPs) and wallcovering manufacturers capture new revenue with high-value wall décor applications for commercial, retail and residential spaces. HP’s digital printing solution consists of a modular range of design software, media, HP Latex Printing Technology, finishing options and industry certifications. The company believes this scalable solution enables customers ranging from small PSPs to large wallcovering manufacturers to take the growing customisation trend to the wall with unique or short-run wallpapers, wallcoverings, wall murals and canvas prints. At the exhibition HP demonstrated the expanded suite, including new content, design and mobility features for HP WallArt as well as updated finishing and media options. 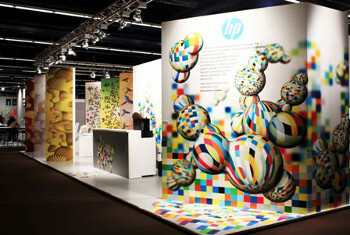 A special feature was a digital wall décor showroom at HP’s exhibition booth created by renowned industrial and interior designer Markus Benesch. Its aim was to bring to life the creativity and innovation made possible with digital printing and the complete HP solution. “My goal is to encourage spectators to think outside of the box and see the unusual ways in which digital printing can dramatically alter a space, as well as the design workflow,” said Markus Benesch, owner, Markus Benesch Creates. “HP digital printing technologies create a world where designers no longer need to print large batches of wall décor at once, but where they can be fast as light, moving immediately from idea to design to production to delivery. Benesch explained further: “Our mission is to connect spaces and objects with people, weaving a new functional aesthetic and sensorial fabric into everyday life. My walls are bold messengers of courage, fun and creativity. In a rapidly changing world, technology is evolving constantly. For this reason HP digital printing technology is the perfect chisel and hammer to shape my playful graphic worlds. 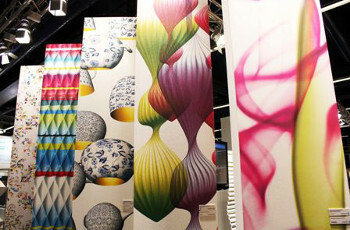 As a curious designer who has seen this industry develop, I can assure you: the future of digital wallcovering is now." HP WallArt is an easy-to-use, cloud-based web service that helps simplify the design, visualisation and production of customised wallcoverings. Introduced at Heimtextil 2013, HP says the tool is already in use by more than 1,100 customers in 66 countries. Following this successful trial, HP WallArt will remain free for new and existing HP Latex Printing Technology customers. Integration with customers’ online storefronts for a customised and branded web-to-print solution that streamlines quotations, billing and managed information systems. A free HP WallArt application for iPad®, available through Apple’s App Store, which provides real-time, interactive design and accurate previews of the finished wall layout. Easier production of canvas prints, including a multi-panel canvas option and automatically generated installation instructions. HP PVC-free Durable Suede Wall Paper, a sustainable wallcovering substrate for high-traffic commercial areas that meets American Society for Testing Materials (ASTM) F793-Type II certification when printed using HP Latex Inks. Expected to be available from BMG in spring 2014, this new media option is compatible with common adhesives and has been engineered with ColorPRO Technology to deliver excellent colour. Certifications to help meet international wallcovering industry standards. HP Latex inks have been tested and certified by authorised third party labs and are compatible with industry standards, such as the EN233 standard for washability and colourfastness, the Euro class standard, Class B for flame retardancy and the CE Mark. These tests have been performed on a range of substrates from leading media vendors. Automatic winding systems from Fotoba International, which can reduce labour costs and improve efficiency by providing ready-to-pack wallcovering rolls directly from the cutting device. Two models are now available: the REW104 for media up to 104 cm (40.9 in) and the REW160 for media up to 160 cm (62.9 in). Copyright © 2014, DPNLIVE – All Rights Reserved.